You only get one set of ears. Most shooters know this about their eyes and wear eye protection as a result, but permanent hearing damage is a near-epidemic among older shooters and we do ourselves a great disservice not to protect our hearing. Maybe part of that is the fact that the possibility of instantaneous blindness from a fragment of lead splashing off of a piece of steel into your eye sounds a lot scarier than the gradual loss of a sense we tend to take for granted, but it isn’t any more permanent. Noise-induced hearing loss (NIHL) is a real problem in our industry, and so this is as much public service announcement as review. We’ve got to take better care of our ears. Anything that makes a noise louder than about 85 dB can cause NIHL. Louder noises mean more damage in less time, but just because you don’t perceive a change does not mean you aren’t hurting yourself. In fact, part of the real danger of hearing loss is that most of it IS imperceptible. We are constantly causing minor damage to our hearing on a daily basis. The actual volume of gunshots depends on the caliber, but considering that even QUIET suppressor/caliber combos are still roughly 120 dB, gunshots are way above the damage threshold (approximately 140-190 dB). So for those of us who shoot more than “barely recreationally,” good hearing protection habits are a must. And although I rarely “double cup” at outdoor matches because of all the running and the headaches a lot earmuffs give me after wearing them all day, I have certainly started doing it at indoor ranges or when I’m just spectating at a shooting event (maybe even at a match when I’m not the shooter). 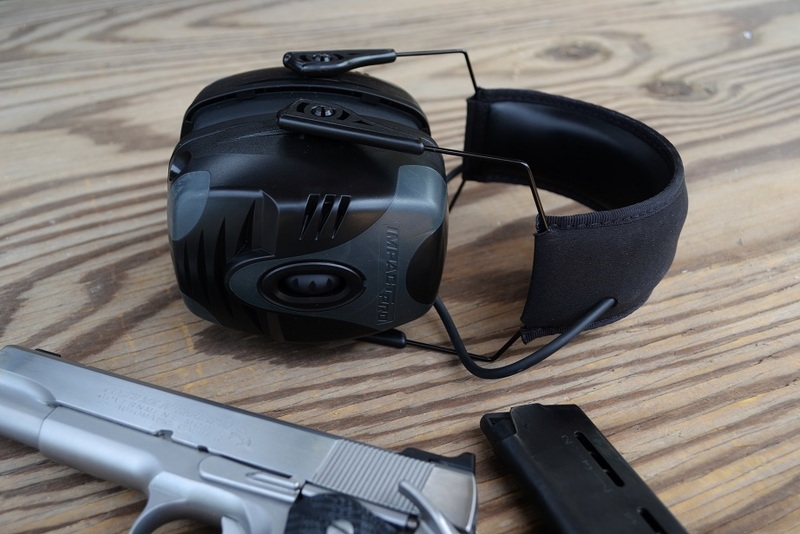 Since earlier this year, for all of my indoor shooting excursions I have been taking the Howard Leight by Honeywell Impact Pro earmuffs along with me to wear over my custom plugs. And I have to say, they are a great, cost-effective option so far. For anywhere from about $60-$80 at most online retailers, they offer 30 dB noise reduction for an affordable price. Granted, these are NOT the option you will want for shooting long guns because of how large the cups are. They interfere with aiming. But Howard Leight makes other, thinner items in the Impact series as well (the Impact Sport is one) that are designed with long gun shooters or 3-gunners in mind. 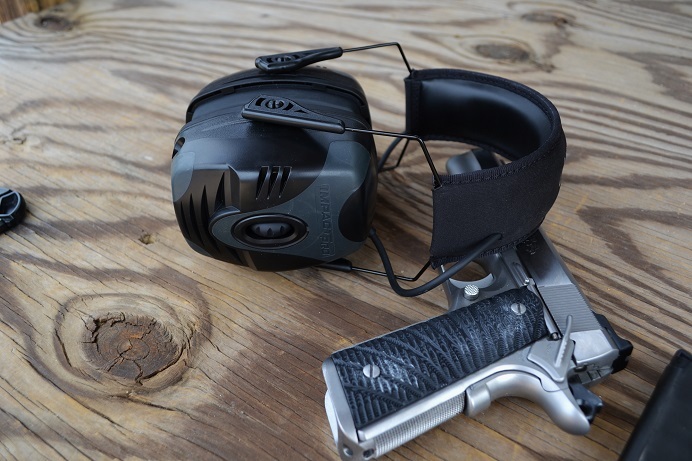 For me, shooting pistols most of the time, the Pro muffs are great. But if you shoot rifles a lot, the thinner options cost even less than the Pro version, so it is definitely feasible for almost any shooter. And any of these products offer a lot more protection than the little foam earplugs I see a lot of people out on the range using. For those of you who don’t know how electronic hearing protection works, the microphones in the earmuffs amplify sounds that are low-noise (like conversations at the gun range or range commands) while shutting off when a noise goes over about 80 dB and enters the “potentially harmful” range. It is something I have actually become a fan of because it makes conversations about 3-4x louder but also adds additional hearing protection to the equation. I.e. you stop being “that guy” who yells at all your friends every time you go shoot because you can’t tell how loudly you’re talking. The Impact Pro series also includes an auto-shutoff (which I have accidentally taken advantage of on numerous occasions), as well as an auxiliary input that allows you to listen to music or whatever else between drills if you’re having a solo practice session at the range. I tried the aux input without being on the range a few times as well, but inside in a quiet room the microphone in the Impact Pro muffs picked up some electronics that were running and magnified the impedence as a humming sound. Not what they’re made for, but I had to try it just to see. On the range, any “hum” was completely imperceptible when I hooked up my iPhone, so I don’t think it was any issue with the cable. The battery is easy to change, although I have only changed it one time so far, and the ear cups are very padded and comfortable. –Colt Driver; for more information, check out the Impact series by Howard Leight! These earmuffs are available on Amazon as well as at numerous outdoor product retailers. *Thank you to Howard Leight/Honeywell for sending a demo pair to use for purposes of conducting this review. All of the opinions are my own, but the earmuffs in these photographs were a review sample. I have been wearing Howard Leight muffs for years. They are top notch in every respect. Colt mentioned the muffs offering cold protection in winter. As all who wear muffs know, they can be very hot in the summer, causing a great deal of sweating. My buddy at Honeywell Safety turned me on to Howard Leight Cool Pads. http://www.howardleight.com/ear-muffs/cool-pads. These greatly reduce heat and sweating. I highly recommend them. They’re great, Jim. Used them again in a chilly match two weekends ago over custom plugs and they were warm and blocked out some extra noise. I am ordering some cool pads after it starts warming up again. Thanks for the intel!